I've been re-doing large parts of the game lately. It's not entirely on purpose, more that I had no idea what the heck I was doing when I started all this. The first room is such a mess I'm afraid to touch it in case it explodes, but it all works somehow? The hallway room is now gone and replaced with 2 others, with most parts of it rearranged elsewhere. I changed Matt (the main character) also, as he was the first piece of pixel art I ever drew, and it was looking out of place next to some of the newer characters. I would say it was a dumb decision thanks to all the animations that need to be fixed now, but I wanted to do it anyway. I really want to show another room, but as there are only 7 it seems a bit insane to spoil any more. The good news is that I'm getting faster and faster at making stuff. A lot of animations are finished and ready to place into the game, and the backgrounds are all done. There's no concrete release date, but I wanted to let people know it's still being worked on and I hope it won't take too much longer. Hadn't seen this before, looks great! Loving it, keep up the god work. And now I'm intrigued with that 1st picture. I don't know how I've missed this before but glad I know about it now. I think using a Lucasarts art style but with your own designs is fantastic. Definitely looking forward to seeing this progress through to completion. Get me a 100 brains and then we can talk. They mean a lot as I've spent so much time on this game and there's always a little voice in the back of my head saying that no one will be interested. VERY nice graphics! This is the first time I'm seeing this game, and I can't wait to hopefully play it--looks like fun!! I love the big dude with the yellow teeth--he looks like trouble. there's always a little voice in the back of my head saying that no one will be interested. Keep up the good work. 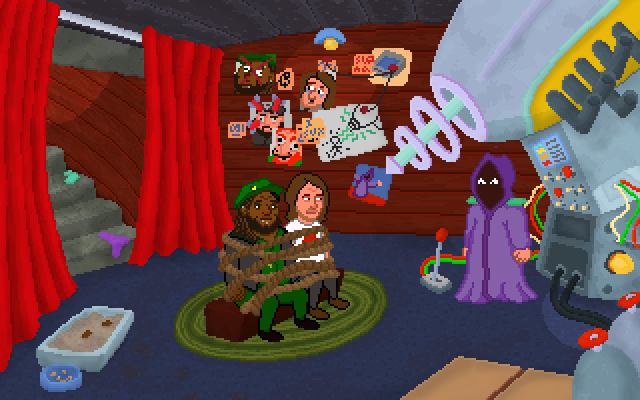 The world needs more crazy, colorful adventure games. 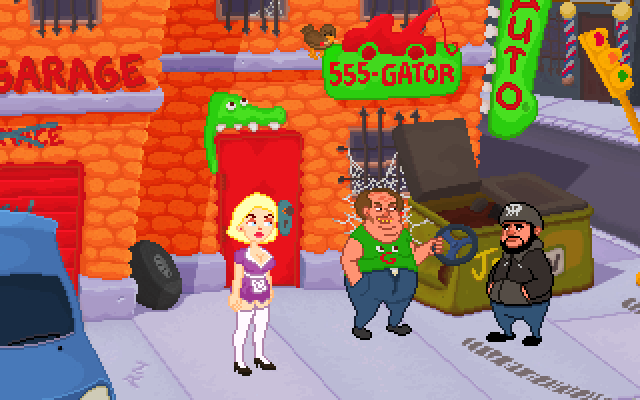 Also, the red-haired fella makes me think of Brian Posehn. I really like your aesthetic!! I thought on the first picture the boxes were adventure game boxes!! I am looking forward to this. I should have listened to my mother---I should have practised. I thought I'd post some comparisons to show how I've been redoing the game over time. Every room has been redone at least once, some a lot more. The street room has been the worst culprit by far, needing to be changed again and again. Thankfully it's finally done. It's up to save 53 in Photoshop! ...And actually that car scene is the front of building scene in sam and max. Busted! I think you're the first person to notice that. The street room was originally just going to be a quick intro you would spend 20 seconds in so I used Sam & Max as a reference. 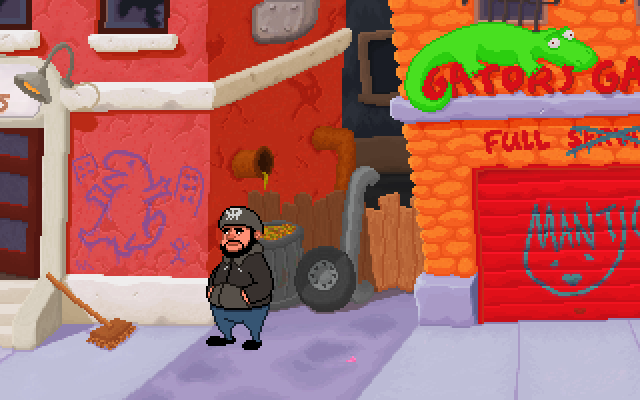 I love that game, and the guys at Lucasarts were such great artists it's almost depressing. But the intro was no good, it didn't do enough to introduce the plot so I scrapped it and made something different. I couldn't bring myself to just throw out all that work though, and I kept changing things and adding new characters and rooms and puzzles... Eventually tripling the size of the game. Which is why it's taking so long. I'm 99% 80% certain it won't grow any larger though. 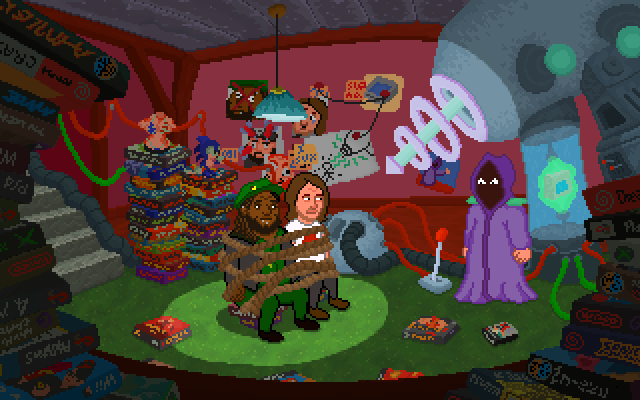 The Sam and Max room it's based on. Hopefully it's changed enough that it's more of a homage than a rip-off now. And Sam & Max was designed, drawn and animated by Steve Purcell - an artist and long time employee of Lucasarts as someone who used Sam & Max in training material while the SCUMM scripting system was benig developed. edit by Darth - non game-related images removed. Feel free to send via PM! Wow, this is great! I love seeing such scrolling backgrounds in adventure games! Gotta love all of the smaller details as well. 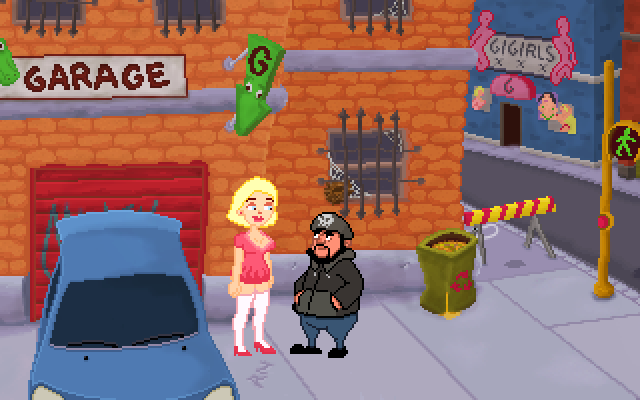 Wow, I haven't logged on to these forums for at least a year, so I can't believe practically the first thing I see is a SBF fan game that looks amazing. Were you likely to need a hand with anything basic, such as testing, or writing some filler dialogue? Man, I can't get over how good your pixel art is. Mine's really sucky and it took YEARS to get there. Do you also have a misspent youth fiddling around with MSPaint?